One of my goals this year is to make feedback useful. I’m honestly not entirely sure what that is going to look like, but to start I’m changing the format of my skill quizzes and how my kids line up to retake them. I know, earthshattering, right? The above would fill the top half of a regular 8.5×11 sheet. Those are the first two skills I started out Precalculus with last year as the vectors until let into trig nicely and checking to make sure they remember squaring negatives in the calculator blindly is problematic is a good thing. The last column is to help me enforce my policy that students prepare for the retake. In order to retake the skill, they must show me their corrections. I’ve been very lax on this in past years but I think with the feedback column I can help students be more self-sufficient with how to prepare. Self-sufficient. Isn’t that what we want all of our students to learn? I feel a bit like a parent telling a kid to look it up in the dictionary, but I don’t think that’s a bad thing. If the kids know they can figure it out and where to look, that’s half the battle in math (read: life) sometimes. I know I’ll be facing kids who completely believe they cannot do math without ridiculous amounts of help and I am hopeful that good feedback will help them learn skills to help themselves without clinging onto those they deem ‘experts’. I also have thoughts about changing my grading system. As it stands, I take the highest score and it stays no matter what happens. Kid could get a 3, 1, 2, 1 and their score would stay a 3 and that’s bothersome to me. I’ve swept it under the rug a lot because it’s a quiz system for me and I give regular tests and we do projects, but if my grades are going to accurately reflect what a student knows and is able to do, then that is definitely not happening. The strongest contender for replacement is Kate Nowak’s system from back in the day, but that would involve switching to a 0-5 system. I still have about 3 weeks to think this over, though, so I’ll keep y’all posted. This entry was posted in Lesson Disclosure, SBG. Bookmark the permalink. I saw your sample and thought, “there it is!” Earthshattering or not, the format lets you (forces you) set up the feedback loop. Very cool. Great minds must think alike. I did a very similar thing this year. 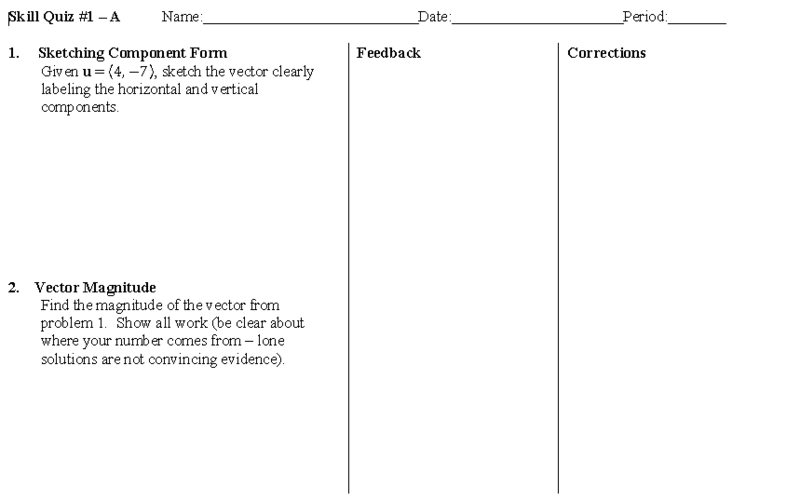 Where students have to do a reflection based on the comments before they receive their grade. Keep on being awesome! I was grading some quizzes and I thought, “Hmm… this is ok, but I remember reading something that sounded better.” And it was this! So I have to ask, so has it worked for you? This system has worked much better! They kids really read the comments and are way better at making corrections prior to asking for a retake than before. I have been pleased with it.